In conceiving the piece I did quite a lot of research on shuangjia (two full Chinese calendar cycles) and double soloist concertos. I encountered many interesting things, but I was most fascinated by Mei Lanfang’s sword dance, which has since influenced me deeply. The Peking Opera concept of incorporating martial arts into performance was an important inspiration when I wrote and designed the music for Crouching Tiger, Hidden Dragon with Ang Lee, and I feel by introducing martial arts into Peking Opera we can better show the world the spirit of the Chinese discipline. With “Farewell My Concubine” I placed my focus in Mei Lanfang’s sword dance as the foundation and inspiration for the piece, allowing space for broad imagination in the piano solo. I have read many stories about Mei Lanfang, but among them, his encounter with Charlie Chaplin in 1930 touched me the most. Whenever I’m in New York, lingering in the Metropolitan Opera and Broadway theaters, I always imagine a scene from 80 years ago. I think of Mr. Mei having an exciting conversation with Charlie Chaplin; they talk about the charm of Peking Opera and movies, and the dialogue between the piano and Qingyi. 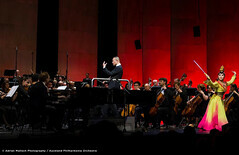 When it was time to celebrate Mei Lanfang’s 120 year legacy, I wished to compose a piano and Qingyi double concerto. Why did I choose the piano as the solo instrument in this piece? To me, the piano is the most universal instrument in the world, and the piano connects to Peking Opera because it is China’s national opera. These two art forms each carry musical and theatric elements from East and West. The artistic and philosophical significance is very enticing. I feel that by using the piano to portray Xiang Yu, the “Hegemon-King of Western Chu,” and Qingyi to portray Chinese beauty Consort Yu, layers of artistic content and patterns are presented. Writing a double concerto at this 120th year commemoration has significant meaning from a cultural and historical standpoint. In this piece, I included three Mei School singing styles; they are the most iconic parts of Mei Lanfang’s Farewell My Concubine. These lyrical styles embody Consort Yu’s gentleness, beauty, and kindness, and also her selfless love to others, her family, her country, and the world. On the contrary, the piano showcases a hero’s unparalleled valiance, the willingness to die rather than giving up his noble integrity. There’s a Chinese saying: “A hero’s greatest challenge is beauty.” The love of Xiang Yu and Consort Yu was beyond romance; it encompassed love to their family, their country, and the world. The conversation between piano and Qingyi within these three Mei School singing styles is actually a tragic love story between man and woman, sky and earth, and piano and Peking Opera. The sword dance in the Peking opera Farewell My Concubine was Mei Lanfang’s meticulous creation; he never stopped working to improve his sword dance. He designed the dance to portray the invisible image of a plum blossom, creating a dance with strict steps and internal structure. Audiences would see a balance of extroverted energy with introverted strength, the contrast of a budding blossom and the vigor of a hero. By incorporating the structure of Mei’s plum blossom sword dance into the piano dialogue, I tried to create a synergy between dance and music, hard and soft, sword and love. Piano concertos have always been one of the most popular forms in the performing arts. Research and education on the artistry, history, and technique of piano playing are found all over the world in orchestras and music schools. In China alone, there are 30 million children learning to play the piano. Because of this I think that introducing Chinese elements into the art of piano playing, through the influence of Peking Opera, is an area worth exploring. 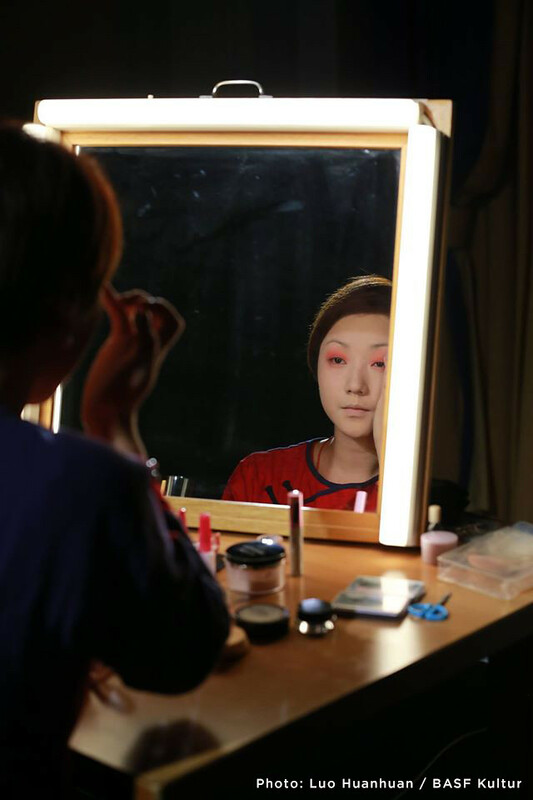 For me, Peking Opera is not exotic, or just an étude on flirting with foreign elements. The spirit of Peking Opera flows in my blood. Ever since working in Hunan with their Peking Opera troupe, I have been researching percussion in the art form. The idea of incorporating these elements into piano playing is very exciting to me. With this in mind, I created four designs for the piano part. First, I percussion-ized the piano, treating it as if it were a percussion instrument in Peking Opera. Second, I used the piano to embody lyrical sounds. Third, I wrote the piano parts with a “Xiang Yu” spirit, because in my heart, the piano represents a heavy, strong, majestic quality. Fourth, the left and right hands switch functions at different times; the flowing right hand becomes a percussive rhythm and the rhythmic left hand becomes a carefree spirit just like the Jinghu. The piano and Consort Yu represent the inseparable Jinghu and Qingyi. Concerto for Piano and Peking Opera Soprano “Farewell My Concubine” blends with the sounds and poetic qualities of Peking Opera. It carries a story. Even though it is a single movement work, the piece actually has five continuous sections: (1) Surrounded by the Enemies; (2) A Clear Moon; (3) A Drink while Consort Yu Sings; (4) The Piano Sword Dance; (5) Farewell My Concubine. These five continuous sections are deeply connected. 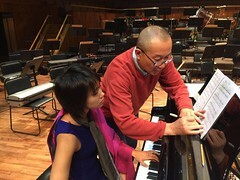 I am very grateful to the Guangzhou Symphony Orchestra and Mr. Yu Long for giving me the opportunity to discover and combine piano and Peking Opera into one. I also thank Yuja Wang and Xiao Di for their support, as well as their hard work and courage to explore. Note: The Peking Opera Soprano and Water Basin (Perc. I) is amplified.